The Glamorous Life of a Housewife: Home Girls. It was 1am and I was scrolling mindlessly through my phone because I had taken a nap with the babies that day and of course, couldn't fall asleep. WHY do I do that? It's a cycle I'm stuck in because if I nap with them then I can't go to sleep until 1am and then I'm tired the next morning so I take a nap when they do ... and then it's just all messed up. But anyway, I was looking at my phone. A Facebook notification popped up and it was a girl Husby went to college with that is my virtual BFF because we are so much alike. 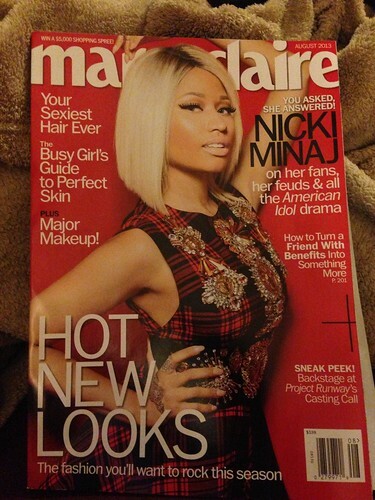 She was like, "please tell me you get Marie Claire magazine. If you don't, you must go get the August issue and turn to page 130." I immediately replied with a "No, I don't??? Why???" The suspense was killing me. Then she posted a photo on my wall of THIS. Um. HELLO! THAT'S ME! MY BLOG! IN A MAGAZINE! Totally freaking out on the inside, but not squealing to wake Husby, I tried as hard as I could to read the little section of the article that she posted. 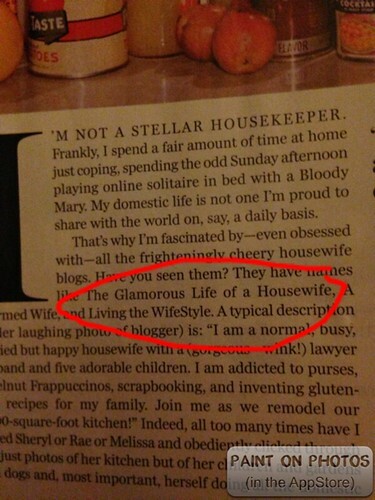 From what I gathered, the author was making fun of housewife blogs but kind of secretly loved them herself. I laughed because, hey, I know housewife blogs aren't for everyone :), and was just so excited to see my blog in a magazine! So fun! I truly thought that the author was writing this article, needed some blog titles to throw in there so she googled them and mine popped up. I tried googling "housewife blogs", and mine was the second to pop up, so I figured "Eh, she probably doesn't read my blog, but still! Fun!" I wanted to have the magazine as a little keepsake for myself so I went out and bought it tonight. I bought my Mom a copy, too, because she had asked me to. Hey, she's my biggest fan! If my name was in the Podunk Times she'd buy a copy! When we got home, I curled up on the couch to read the article and came upon an excerpt where the author was talking about giveaways and how this particular blogger was giving away Pink Sugar lotion and then I lost my breath. I. Gave. Away. Pink. Sugar. I gasped, still holding my breath, and kept reading. Then there it was, lo and behold, I WAS QUOTED! IN MARIE CLAIRE! 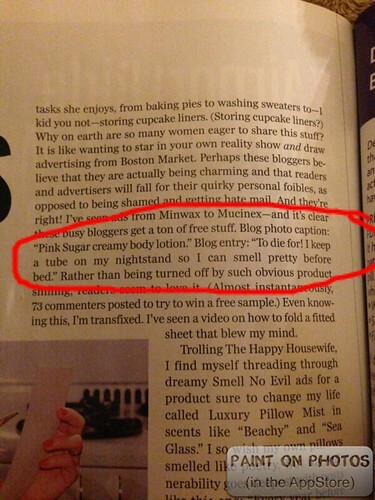 MY WORDS FROM MY BLOG WERE IN MARIE CLAIRE! I could not stop laughing and screaming! Oh my GOODNESS! She was totally making fun of what I said, but who cares?! I SAID IT! AND IT'S IN A MAGAZINE! I sca-REAMED for Husby to come read and we were both just laughing and in disbelief. I mean, what?! This was blowing my mind! I quickly went back to my Pink Sugar giveaway post and sure enough there sat my words, verbatim. I called my Mom and started talking so fast I'm sure she couldn't understand a word I was saying - pink sugar, giveaways, quotes, what?!? The end of the article was her referencing the Pink Sugar again and how maybe she will win it and I just couldn't help but laugh. Had I known where that post would end up, I would have died! 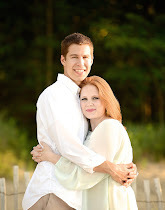 I truly am a wife and mommy who has always dreamed of these days that I'm living now. I don't expect everyone to get that - just like I don't understand other people's personal dreams and goals, because they're just that: personal. But, I am 100% real about loving this life God has not only blessed me with, but entrusted me with. And y'all, now that I'm famous, maybe you'll see me on Food Network soon ... but I'll have to film in my Mom's kitchen because hers is a lot more glamorous than mine. "Whitney's Glamorous Kitchen", I can see it now! Tune in, friends. I'll be on right after Trisha and P-Dub! Okay and ps mark read your post with a big grin on his face and LOLed. He's impressed with your legitimacy and game. Hehe. I would freak out too-that is too cool! BTW, the PINK SUGAR line is my favorite too! I can surely title this article content as the best one ever written in commercial kitchen equipment catering equipment ranges. It’s highly educating, informative and practical with its approach. All thanks goes to the writer. If you really want to send her some mail it to the magazine at her attention. Woohoo! Okay where do you buy pink sugar lotion again? Whitney, this is the best!!! I love it. Your blog is one of my very favorites, and I am so far from a "housewife" (single early twenties girl who works in finance), but I love love love reading about you and your sweet family. You are seriously the coolest! this is awesome! how fun! Congratulations! Woohoo! So fun! 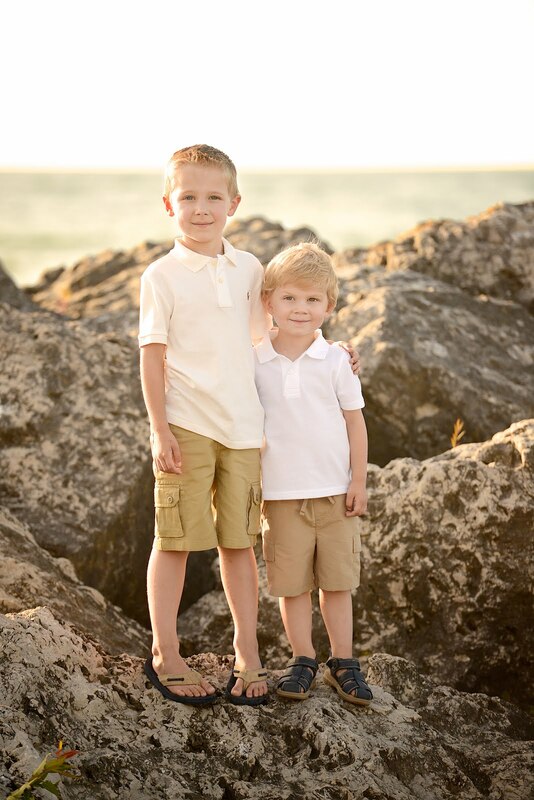 I love your blog and have two little guys who would love to play with Levi and Ezra while we sip our iced coffees! If you're ever in ATL let me know! Okay, first of all, this is awesome. Second, does this make ME famous since I won the Pink Sugar lotion? I love it, by the way! Whitney, this is awesome! I have been sharing it with everyone who will listen! oh my gosh that is so funny!! That's so awesome!! Making a difference in the world, one blog post at a time!!! BTW, I totally adore the name of your blog!!! i was looking for a certain blog with surname Husby in it and found yours. Is it his first name? I am looking for anyone who could be descendant of Jacob Husby who once was a Johnson. his brother settled at Dunn county wi.but jacob whereabouts is still a mystery.